These little pillows of goodness are incredible. I first had some at one of my favorite restaurants: Rezaz Mediterranean Cuisine. If you ever visit Asheville, make this a priority! I thought I would make my own version, but add a few other ingredients. 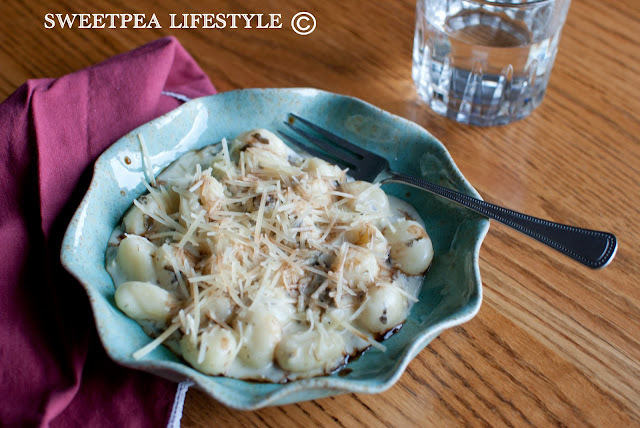 At Rezaz, your plate comes with gnocchi, parmesan cream sauce and cute little green peas added for color and some texture. While I love it, I wanted to incorporate another great flavor combo. Spinach Artichoke dip is such a winner, and it's even better with gnocchi! Top it off with a sprinkle of parmesan cheese and a dash of balsamic vinegar - HEAVEN. Start boiling a big pot of water - enough for your gnocchi to cook. I could say that I made my own gnocchi from the left over mashed potatoes we had in our fridge. However, I just went to the store and purchased some from the pasta aisle. The same thing! And zilch work! WOO HOO! While you are waiting for your water to boil, put 2 tablespoons of butter in a pan. Let it melt, then add 2 tablespoons of flour. Stir till combined and let cook till the raw flour taste isn't there anymore. About 2 minutes. Keep stirring it frequently, it can burn easily. You've just made a roux! Way to go. It's not difficult, huh? After a couple minutes, add some milk. About a cup. Whisk the milk into the roux, getting all the lumps out. Add a scoop of spinach artichoke dip. You can either make this yourself, or buy it from the deli section of your grocery. Stir it well, until combined. Add some salt and pepper to your liking. 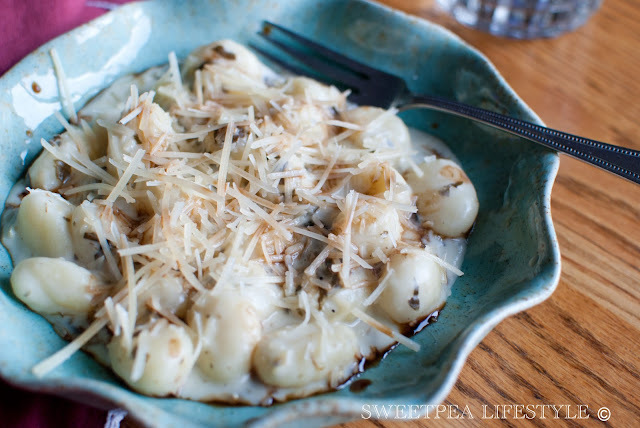 Add your gnocchi to boiling water and cook for 2 minutes. Or, until they pop up to the top of the water. Scoop them out with a slotted spoon into a bowl. To your serving plate, add the gnocchi followed by a ladle of sauce. Top with a sprinkle of parmesan cheese and a dash of balsamic vinegar.